For all you last minute shoppers out there, I’ve put together the last in my series of city themed gift guides. What better city to end on than the city that never sleeps, New York New York. Lucky for you all these are available on the great British high street, so no worries should be had about online delivery times. You’ll just need to get out there and use those elbows. What says New York more than Michael Kors? Luckily you can pick some up in House of Fraser, I really liked this two-tone purse and I’m sure the recipient of this would love it to. I’m all for the more understated side of the Michael Kors brand, this is a classic style and colour. Looking for a stocking filler? Maybe it’s Maybelline…sorry I couldn’t help it. New York’s well known make-up brand is available plenty of places on the high street. My favourite product from them has to be their color tattoo, it changes up your look really quickly and lasts all day. 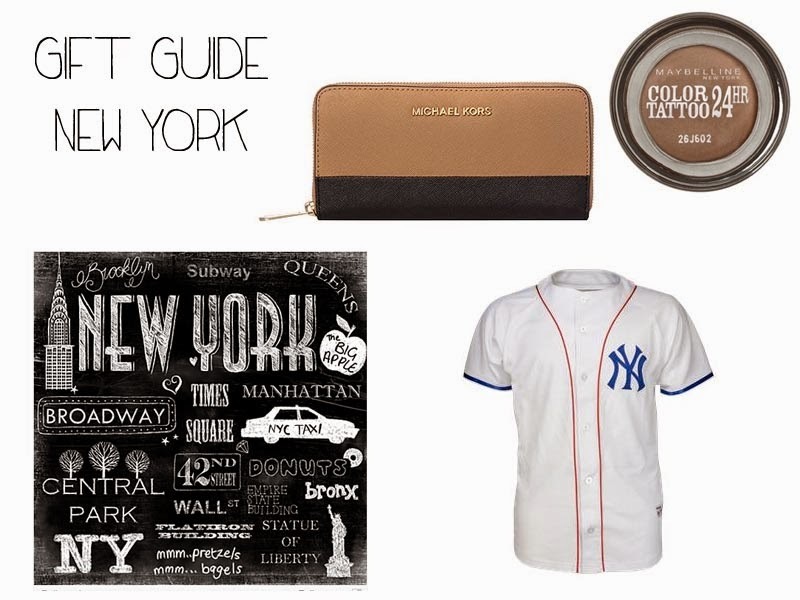 George Home has plenty of New York prints to bring a bit of the big apple into your home. I really liked this understated black and white print, the best thing is this is only £5 leaving you plenty of change to buy more last minute presents. Lastly if you want to inject a little New York spirit into someones wardrobe then you should go for this Yankees shirt. You can get this from Footlocker, this is a great unisex present depending on the person you’ve got in mind. I’d get an over-sized one and wear it as a dress with heels, sports luxe non? "In the Spotlight: George Home"
"What I Wore: Boxing Day 70’s Inspired"